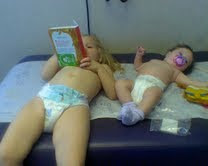 So awhile back (January 12th to be exact) I took both girls in for their check-ups. 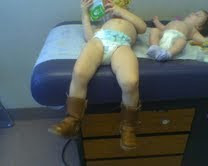 She insisted she keep on her boots during the appointment, and she did most of the time. She is developing well. She loves music and picks up songs quickly. Her vocabulary is increasing daily and I'm always amazed at what she is learning to communicate to us. 4:30-8:00- Play time with dinner somewhere in the mix. Height: 26 inches (98th percentile) I didn't believe the nurse when she said that so I asked her to measure her again. Sure enough she is 26 inches. 8:00- Eat, then straight to bed. 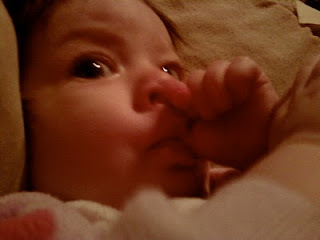 There are certainly differences between Hannah and her big sister. One big thing...Hannah's a thumb sucker. Hannah's hair isn't as curly as Elizabeth's. And though, Elizabeth's eyes started off light, they were not as light as Hannah's. We are praising God for the health of our daughters who are similar, yet distinct. They both are gracious gifts that we daily thank our Maker for.